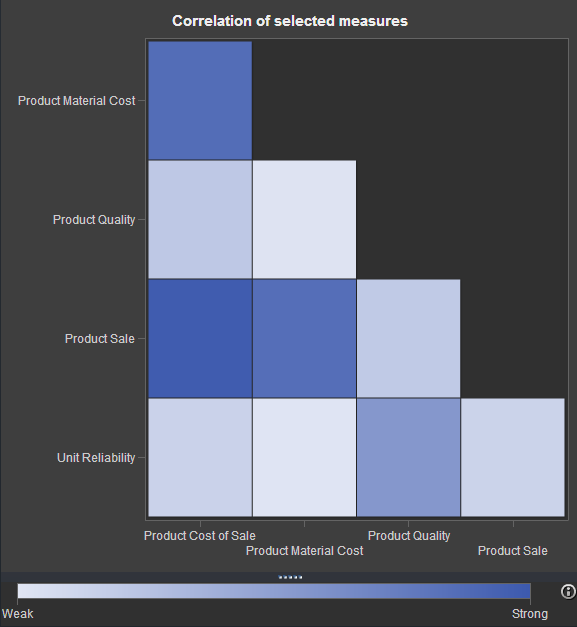 If you've watched any of the demos for SAS Visual Analytics (or even tried it yourself! ), you have probably seen this nifty exploration of multiple measures. It's a way to look at how multiple measures are correlated with one another, using a diagonal heat map chart. The "stronger" the color you see in the matrix, the stronger the correlation. You might have wondered (as I did): can I build a chart like this in Base SAS? The answer is Yes (of course). It won't match the speed and interactivity of SAS Visual Analytics, but you might still find this to be a useful way to explore your data. 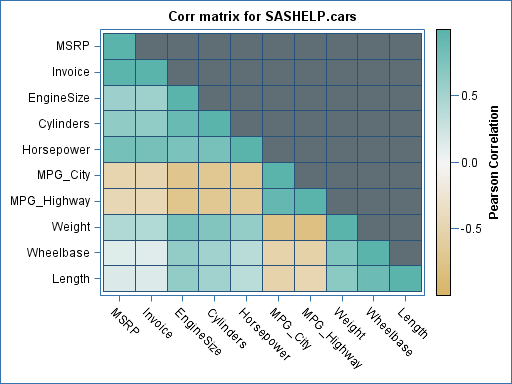 Use the CORR procedure to create a data set with a correlations matrix. Actually, several SAS procedures can create TYPE=CORR data sets, but I used PROC CORR with Pearson's correlation in my example. Use DATA step to rearrange the CORR data set to prepare it for rendering in a heat map. Define the graph "shell" using the Graph Template Language (GTL) and the HEATMAPPARM statement. You've got a lot of control over the graph appearance when you use GTL. Use the SGRENDER procedure to create the graph by applying the CORR data you prepared in the first two steps. I wrapped up the first two steps in a SAS macro. The macro first runs PROC CORR to create the matrix data, then uses DATA step to transform the result for the heat map. Note: By default, the PROC CORR step will treat all of the numeric variables as measures to correlate. That's not always what you want, especially if your data contains categorical columns that just happen to be numbers. You can use DROP= or KEEP= data set options when using the macro to narrow the set of variables that are analyzed. The examples (near the end of this post) show how that's done. You have to define the graph "shell" (or template) only once in your program. The template definition can then be reused in as many PROC SGRENDER steps as you want. This heat map definition uses the fact that correlations are always between -1 and 1. Negative numbers show a negative correlation (ex: cars of higher weight will achieve a lower MPG). It's useful to select a range of colors that make it easier to discern the relationships. In my example, I went for "strong" contrasting colors on the ends with a muted color in the middle. Spoiler alert: These steps will only get easier in a future version of SAS 9.4, where similar built-in visualizations are planned for PROC CORR and elsewhere. You can apply a similar "heat-map-style" coloring to ODS tables by creating custom table templates. If you haven't yet tried SAS Visual Analytics, it's worth a test-drive. Many of the visualizations are inspiring (as this blog post proves). Finally, while I didn't dissect the GTL heat map definition in detail in this post, you can learn a lot more about GTL from Sanjay Matange and his team at the Graphically Speaking blog. Big thanks to Rick Wicklin, who helped me quite a bit with this example. Rick validated my initial approach, and also provided valuable suggestions to improve the heat map and the statistical meaning of the example. He pointed me to http://colorbrewer.org, which provides examples of useful color ranges that you can apply in maps -- colors that are easy to read and don't distract from the meaning. Rick told me that he is working on some related work coming up on his blog and within SAS 9.4, so you should watch his blog for additional insights. 1. How can the heat map be labelled by variable labels instead of names? 2. Without specifying a variable list (which saves needing drops or keeps) the order of variables is the same as in the dataset as seen by position option in proc contents. I would prefer a varlist approach so as to match PROC CORR output from its given var list. At the moment I have not amended the macro but use KEEP and RETAIN in a prior data step so get the right order. I'm not smart enough to solve point 1 though! But for the other axis, you have to reintroduce the labels into the corr matrix data set. Here's one way. Love this! Exactly what I needed. Thank you! An alternative method to custom table templates is much simpler: define a format and use that to set the background of the table cells. This works in PROC TABULATE and PROC PRINT. I use a non-linear 18-point scale from red to blue through white coded as HSV colours. Thanks. Your example is amazing. I want to make a panel graph of this heatmap. For example I am trying to display child mortality rates by year and states by gender in a panel graph. I mean 2 graphs for separate genders with a common Y-axis 'state', male and female graphs show side by side. Basic graph works with the following codes. I was tried to bring your template to Proc SGrender to show a panel graph but failed all my attempts. Would you be able to advice me what changes to be done in your proc template scripts and what changes to be done in Proc SGrender or Proc SGpanel procedures to produce a panel graph. Wilson, this is a great question to post into the SAS Support Communities. Try the board about ODS Graphics. I was wondering if you know what could be causing this and if it's possible to create the heat maps using spearman? Thanks for reporting this. I think this is a bug, but I'll ask the developers and see what I can find out. I found the issue. It's a precision issue with the Spearman output, which sometimes can be so close to 1.0 for self-correlations but can actually be just a tiny bit over 1. That value falls outside of the colormap range that is defined in the GTL code. We can work around with the ROUND function in preparing the matrix for plotting. Thank you so much Chris!! It worked perfectly! Glad to hear! I'm also happy to report that the developers fixed this exception -- should be better in the next maintenance release of SAS. I am trying to use your program verbatim to generate a heat map of the correlation matrix . The only problem is I have too many variables - about 43. So the labels are all overlapping and aren't readable, though the heatmap with the colors are generated fine. Could you point me to a fix or to the lines in your code which I would have to modify? Adding the TIPMAX option allows the higher number of hover-over tips to be included as well. How to add the value (i.e. numbers) in those boxes? I have 9.4 M1 release so textplot is not working in PROC Template. Good question to post on communities.sas.com -- the Programming->ODS Graphics board. Be sure to include details about your version and any code that you've tried. Experts will help! I was able to manage it by using scatterplot with MARKERCHARACTER option in PROC Template. This has been of immense help to me but I am having trouble obtaining partial correlations. I inserted the partial statement and listed the covariates to adjust for and received an error. How can I get around that? What types of errors? I suggest that you post the question to the Stat Procs board on the SAS Communities. Include your code and log -- someone will chime in with helpful suggestions, I'm sure.